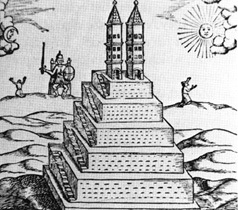 "Templum Americanum" from Athanasius Kircher, Oedipus Aegyptiacus ..., 1652. Source: Thomas A.P. van Leeuwen, The Skyward Trend of Thought, Cambridge: MIT Press, 1986, p. 61.